Brian O'Donovan (aka BOD): Should the Irish people behave more like the Greeks? Should the Irish people behave more like the Greeks? In recent times, people frequently discuss the economies of Ireland and Greece at the same time. There are many similarities between them since, both are now facing economic difficulties which are putting a strain on the entire euro zone. Both countries have discovered that their government's financial position was worse than they thought and it seems unsustainable that they can continue "doing business as usual". However, there is a big difference in the public reaction to the financial crisis in both countries. It is not surprising that the initial reaction in both countries was one of denial. People in both countries initially questioned the competence of economists who told them that their economic position was not as rosy as they had thought. However, once the financial figures were clear and unambiguous, the Irish people seemed to move to a pragmatic where they accepted that adjustments in the public finances were inevitable and the discussion is now mainly about how that adjustment will be made (e.g. tax raises or spending cuts, exactly what to cut etc.). In contrast the Greek people seem to be still very much in denial about the need for austerity. There have been riots in the streets and they are currently without a fully functioning government because while there seems to be consensus that people don't like the current government policy, there is no consensus on what exactly people would like to do instead. The recent good weather in Ireland has caused Irish people to ponder what it would be like if they lived in Greece rather than in Ireland. Some people thing that Irish politicians have become complacent because they are really only worried about a critical editorial in the Irish Times rather than an angry mob rioting in central Dublin. They argue that lenders will treat the Greek debts more leniently than the Irish debts because they have a greater fear of the consequences of taking a hard line in Greece. Next week we will get to vote on whether or not we want our government to sign the Financial Stability Treaty. I am not certain that I fully understand the details of the treaty, but my inclination is to trust that the professionals know what they are doing and to vote yes to let them get on with it. I know that the treaty will limit the budgetary independence of the Irish government, but given our record in recent years it might not be a bad thing to have some limits placed upon the governments freedom to run budget deficits. Some anti-treaty campaigners have been arguing that we should vote no to send a message to the politicians that we can't be taken for granted. Their attitude reminds me of the "Just Say No" slogan that was used as part of the "Stay Safe" program in schools to teach children how to cope in situations where they faced the possibility of sexual abuse. But, while simply saying no in a firm voice might help children escape from abuse, it is not realistic to think that if the Irish government simply say no in a firm voice to the people to whom we owe money they will go away and leave us alone. 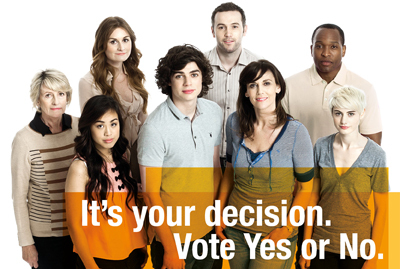 The choices on the ballot paper next week will simply be to choose "yes" or "no". However, if you choose to vote "no", you really should have some realistic alternative strategy to propose. Yes Iceland looks like a good example to follow. But one key difference is that since we are in the Euro zone, we don't have the freedom to devalue our currency.